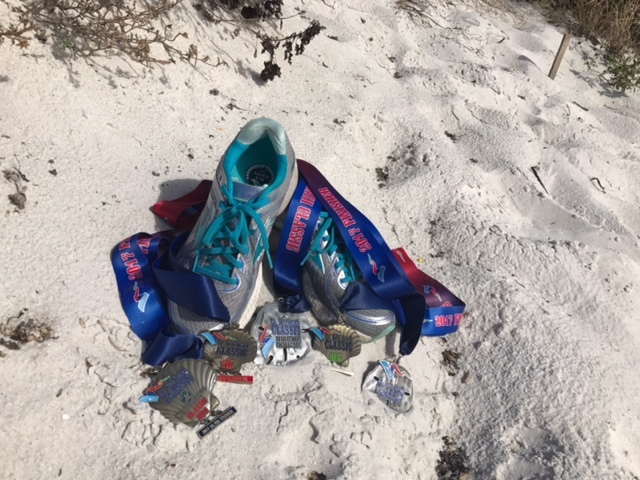 We at Casual Runner love discovering new races, particularly when they are in fun locales: have running shoes, will travel! When race directors put together unique challenges and opportunities, it never fails to capture our interest. 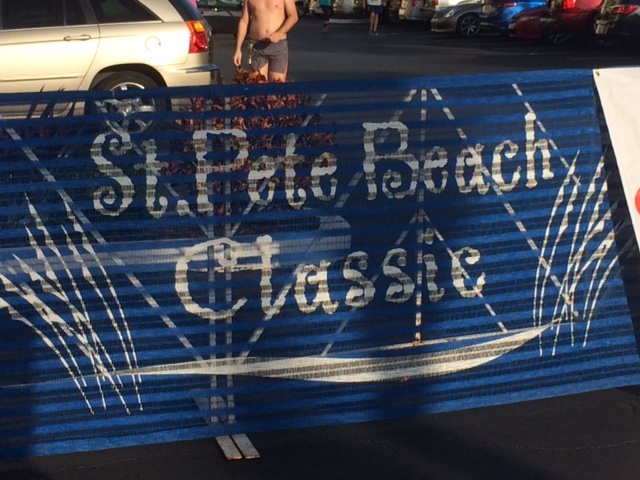 The St. Pete Beach Classic is just such an event. Candace and I were looking for races that would allow runners to extend their runDisney Walt Disney Marathon Weekend trips, and maybe even sandwhich in some Casual Adventures in between. Candace stumbled upon this event that we just had to check out. The St. Pete Beach Classic is a 2 day race series held every year on the Martin Luther King Jr. holiday weekend that consists of 4 races. The first day (Saturday) features 2 morning races, a 10k and a 5k, and an evening race, a 3.8 mile beach run. The second day (Sunday), features a half marathon that will find you travelling over most of the island. Runners may elect to run 1, all, or any combination of these 4 races. If you run the 10k and the 5k back-to-back, you earn the Classic Duo Challenge Medal. 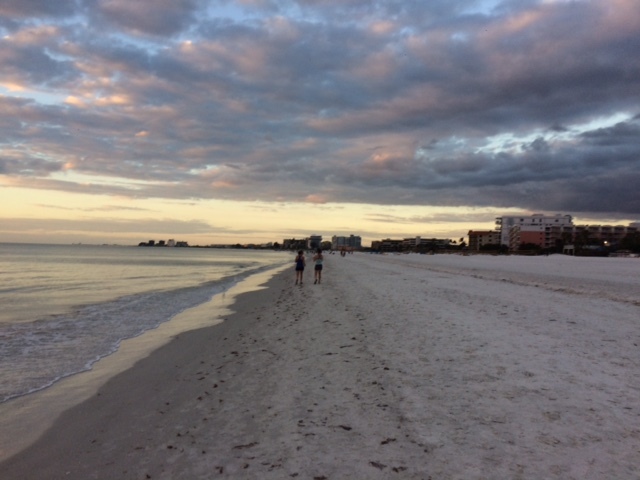 Now, you may be wondering why is the beach run 3.8 miles? That seems like an odd distance for a race. Well, if you add up the distances for all 4 races (6.2 + 3.1 + 3.8 +13.1) you get 26.2 miles! So, by completing all 4 races in a little over 24 hours, you will need to run the distance equivalent to a full marathon. Doing so will earn you the St. Pete Beach Classic Challenge medal. SMO lovers of the world rejoice! 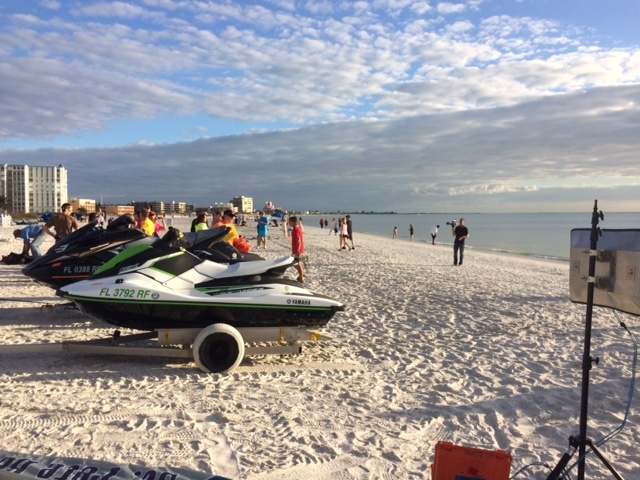 The race expo is held at the Sirata hotel in the heart of St. Pete Beach. The start and finish lines, and all of the pre- and post-race festivities are located in and around this hotel as well. It is on the smaller side as race expos go, but is still far more than “just” a packet pickup, so you can allot your time accordingly to visit the various vendors. Event organizers do give you the option of picking up your packets the morning of the 10k and 5k, but the vendors were not open at the time we did so. Thus, we went back later in the day to check them out. This race is essentially a fun run. It has the smallest field of the 4 weekend events, but in many ways, has the best vibe. The race has an official start just like any other race, and consists of a 1.55 mile down-and-back, where runners head south to the designated point and then come back to finish where they started. Side note: By our count, the course ended up being a little short, so this is one area that can easily be remedied in future years. The entire race is on the sand, which takes a different set of conditioning, training, and stride than road racing, so runners should be prepared. You also have to choose your footwear appropriately as the beach is mostly soft sand, and the hardpack quickly disappeared on us as the tide came in (we slower participants moved up into the soft sand to allow the faster runners to use the hard pack when they were on their way back). Given this, and given that we were running all 4 events (having just come off running the runDisney Walt Disney Marathon 6 days earlier, Candace and my race plan can be simply defined as: HAVE FUN. We planned on walking the course and this was the first race where my race outfit consisted of a Hawaiian shirt! We found some like-minded runners and had a ball. I am going to call out the race directors on this one, because they totally mis-sold this race. Forget about those runners who ran this thing for time, I’m speaking to all of the other Casual Runners out there. This race had, what may be, the most spectacular scenery I have ever seen. 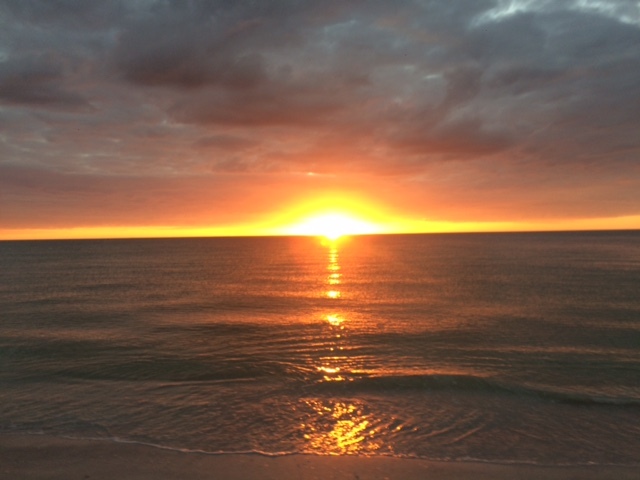 As the entire race takes place on the shores of the Gulf Coast, we were treated to a phenomenal sunset! Unexpect Magic. The sun literally dipped below the surface of the water precisely as we were crossing the finish line. Everything about it was gorgeous! If I were selling this race to runners, I would just keep repeating, over and over: GORGEOUS SUNSET! GORGEOUS SUNSET! GORGEOUS SUNSET! Because the race takes place at sunset, there were lots of vacationers out to watch it. In the process they unknowingly became crowd support for the race. One beer-drinking beach chair sitting guy even pulled up the Rocky Theme on his smartphone and started cheering us along. It was a lot of fun. While the race is timed, there is no SMO awarded for it, so it really is a fun run…er…I mean…a fun walk! So this is where I am kind of kicking myself. 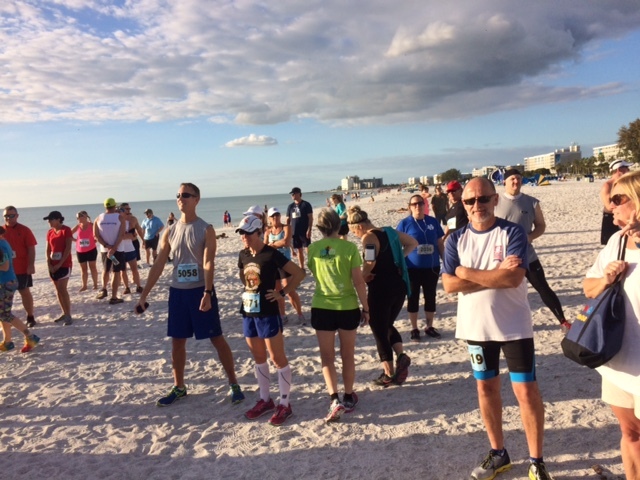 Organizers put up a great post-race experience for the beach run. They have food, drinks (yes, beer! 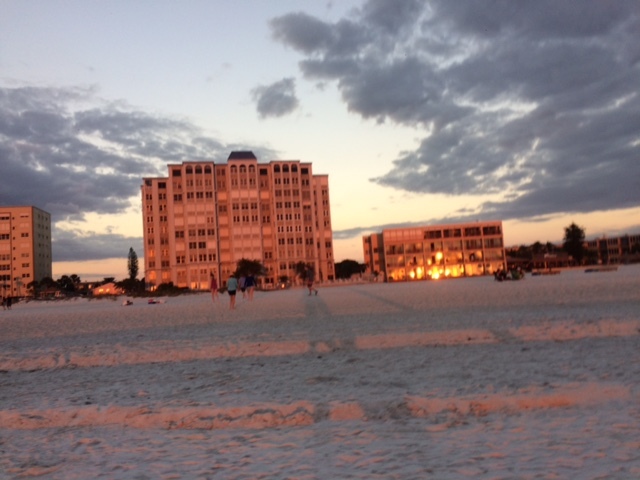 ), live music, and a bonfire, ALL ON THE BEACH! I love this concept. When Candace told me about this, it was all I could think of heading into the race weekend. There was, however, a catch. First, we had been up since 4am on too little sleep, had run 3 races that day, and still had to get up early the next morning to run the half marathon. Even though we did nap, we were pretty tired. Had the festivities begun immediately after the race, we definitely would have hung around for a while. However, we were told there would be an hour before they really got going, which was just too much for us. We went in search of a quick bite to eat and heading back to our hotel to rest up for the next day. We did speak to some runners who stuck it out and they had rave reviews for the band and the overall experience of the bonfire ON THE FREAKIN BEACH. So yeah, I would definitely say that this is a highlight of the event and one that I would like to experience in the future. Candace and I enjoyed this race weekend a lot. 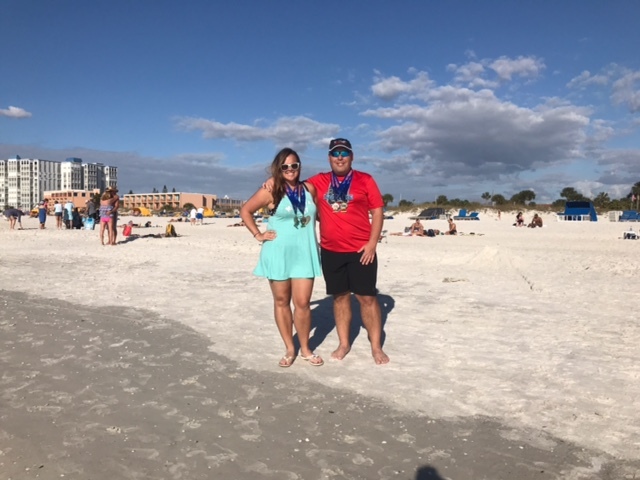 We are going to provide you with more detailed reviews of the 5k, 10k, and half marathon events, but the St. Pete Beach Classic is definitely worth checking out as it makes for a fun race weekend, even if you do not run every race. Plus, who doesn’t want to hang out at the beach for the weekend?? ?